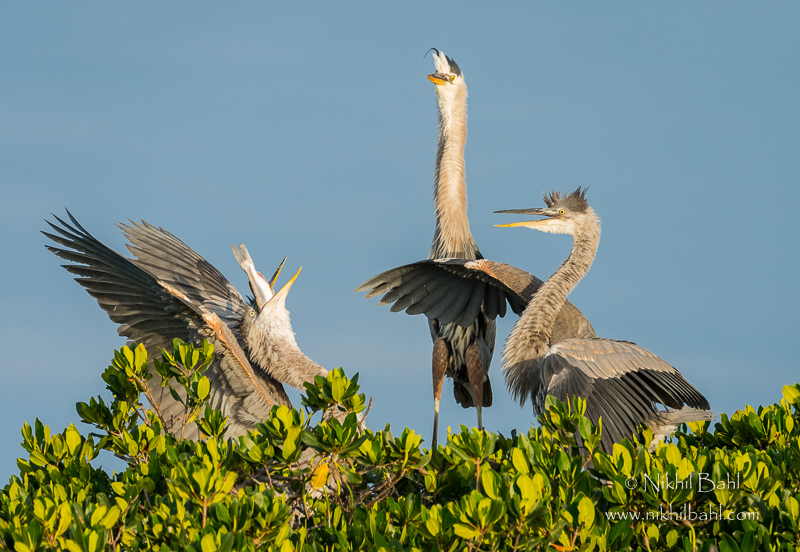 Enjoy 3 full days on a Florida bird photography workshop, touring the best rookery sites and bird colonies in southwest Florida by boat. With many birds displaying their full breeding plumage, the month of April is a perfect time for bird photographers to be in Sarasota, Florida. You will spend 3 solid days (6 full sessions) visiting the best rookery sites and most populated wading bird colonies on the west coast of Florida. Custom photography boats (with captain chairs and all) will give you unparalleled access to the bird colonies with minimal disturbance to the birds. You will receive plenty of help in the field to fine-tune your photographic technique and implement what you have learned in the classroom. During your midday classroom sessions, we will have friendly image critiques so you can get feedback on your photos. Helpful image feedback will give you ideas to immediately put into practice so you can make adjustments during your next shoot. Nikhil will also cover the finer points of image composition so you can take your imagery to the next level. Whether it is a tight portrait or bird in its natural environment, the bird’s posture and placement of elements make the difference between a good photograph and an excellent one. There will also be a full session dedicated to post-processing your images. Nikhil will share several tips and techniques to get the most out of your RAW capture, including processing techniques specific to avian photography. Workshop participants should have a minimum focal length of 400mm. A longer telephoto lens and tripod is also recommended for any land locations we might visit in case of rain. Well before the start of the workshop, a full gear and packing list will be provided so you can prepare for your trip to Florida. Enjoy 3 solid days with 6 boat sessions visiting the best rookery sites and wading bird colonies in southwest Florida. This itinerary is subject to minor changes based on weather conditions. The plan is to have 6 boat sessions perfectly coordinated around favorable weather and lighting conditions. If we miss a boat session due to weather we will come up with an alternate plan and opt for a land based shoot or additional classroom time. During our first evening together we will have an orientation meeting at the hotel from 6:00–8:00 PM. Nikhil will also give an introductory presentation on birds in flight and we will discuss preparations for our 6 boat sessions during the upcoming days. On the second day you will spend all day shooting rookeries from boats with a classroom session in between. In the morning you will have a sunrise session to Roberts Bay Islands to take advantage of morning light and peak bird activity. These rookery islands are an important colony for 800–1,000 pairs of brown pelicans, great blue herons, and great egrets. The afternoon/sunset photo shoot will be at the Dot-Dash-Dit Colony at the mouth of the Braden River. These three small mangrove islands (Dot, Dash, and Dit) are home to the only coastal colony of wood storks in the Tampa Bay area. On the third day you will spend all day shooting rookeries from boats with a classroom session in between. Your morning shoot will be focused on similar photography opportunities as the previous day, but with a twist as we will interpret our subject in a different way. You will continue to hone your skills with a sunrise session to Roberts Bay Islands taking advantage of morning light and peak bird activity. Depending on group preference, we will have an alternate morning shoot at the Dot-Dash-Dit Colony at the mouth of the Braden River. This afternoon/evening’s shoot will take place at the Dot-Dash-Dit colony at the mouth of the Braden River. These three small mangrove islands (Dot, Dash, and Dit) are not just home to the only coastal colony of wood storks in the Tampa Bay area, but also to spoonbills, three species of egret, and a myriad of herons. The bird activity is astounding around sunset when many more birds come in to roost. On our final day together, you will spend all day shooting rookeries from boats with one last classroom session in the middle of the day. Your last morning shoot will give you the flexibility to choose to return to either Robert’s Bay or the mangrove islands of Dot, Dash and Dit, depending on bird activity and your preference. We will continue to refine our skills and get those great early morning shots again during peak bird activity. Our final afternoon/sunset photo shoot will be at the Dot-Dash-Dit Colony at the mouth of the Braden River. Today we will approach our shooting in a different way. Now that we have all of the flight images we need of each species we can start to think out of the box. By now you’ll be familiar with the layout of the islands and will have a better understanding of how to get those great flight shots. This is the perfect opportunity to continue improving your newly learned skills or work with Nikhil on artistic imagery and photo inspiration. NOTE: This itinerary is subject to minor changes based on weather conditions. The plan is to have 6 boat sessions perfectly coordinated around favorable weather and lighting conditions. If we miss a boat session due to weather we will come up with an alternate plan and opt for a land-based shoot or additional classroom time. Transportation throughout; we'll encourage carpooling. © 2003-2017 Nikhil Bahl. All rights reserved worldwide.